Perhaps the best way to explore these classes is to experiment with an actual example. 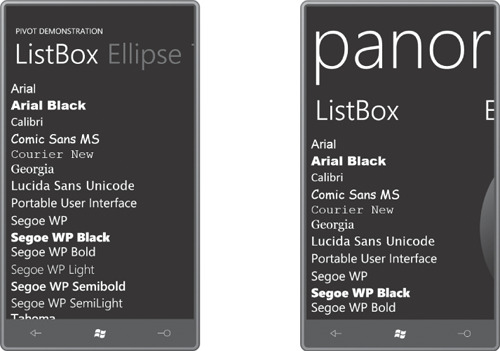 The New Project dialog in Visual Studio allows you to create an project of type Windows Phone Pivot Application or Windows Phone Panorama Application, and you can surely experiment with those. 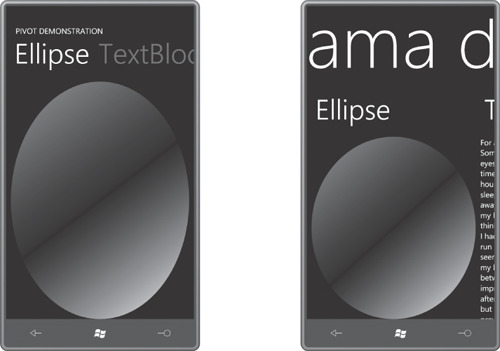 The Pivot control’s Title property is set to “PIVOT DEMONSTRATION.” By default, this title will appear in the same location and be the same size as the text displayed at the top of the normal Windows Phone page. 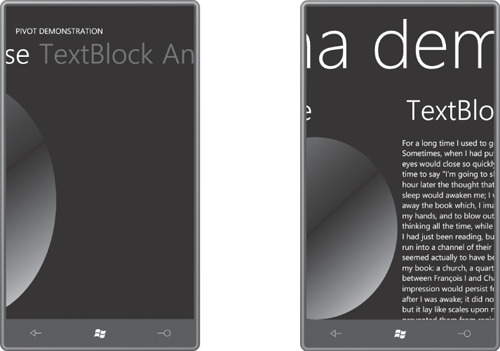 (That’s the text normally displayed by the TextBlock with the name ApplicationTitle.) Each of the four PivotItem controls has a Header property set; this text appears in the same location and is the same size as the customary TextBlock named PageTitle. 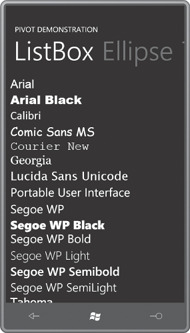 <TextBlock Text="Hello, Windows Phone 7!" Notice the header of the first PivotItem to the right of the active one. 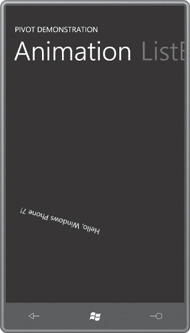 The animations are tailored for the approximate size of the content area of the PivotItem for the large screen in portrait mode. 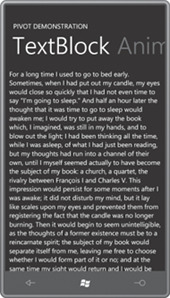 If you turn the phone or emulator sideways, the TextBlock will drift off the screen temporarily. 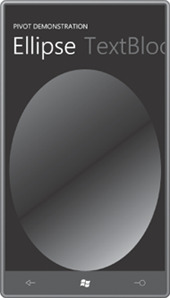 As a result of the large Title, the Panorama offers less vertical space for the content of each PanoramaItem. Slightly less horizontal space is available as well because the next item to the right is peaking through at the right edge. Notice how the Title of the Panorama has also shifted to visually indicate where you are in terms of the virtual width of all the content. The Panorama gives a much better sense of a wide virtual screen through which a viewport is visible, particularly when used with a wide background bitmap. The Pivot seems more like it’s occupying just the screen area and works by sliding individual items in and out of view. The Pivot control defines several events that the Panorama control does not: LoadingPivotItem, LoadedPivotItem, UnloadingPivotItem, UnloadedPivotItem. These events signal when one item slips out of view and another item slips in. These events don’t quite apply to the more fluid nature of the Panorama. Both Pivot and Panorama define SelectionChanged events, as well as SelectedIndex and SelectedItem. The selection is considered to be the PivotItem or PanoramaItem in full view, and the event isn’t fired until the item finishes sliding fully into place. Both Pivot and Panorama define TitleTemplate and HeaderTemplate properties of type DataTemplate so if you use bindings to set the content of the control you can define a visual tree to indicate how the Title property and Header properties use the data. The HeaderTemplate property is particularly important if you bind the ItemsSource property of Pivot or Panorama to a collection, in which case you aren’t creating the PivotItem or PanoramaItem objects explicitly. 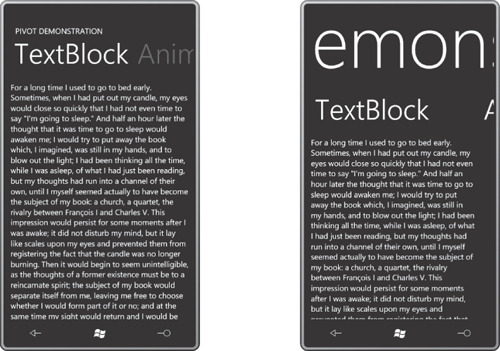 You’ll need this HeaderTemplate for a binding to set the Header text, but the template can consist solely of a TextBlock. If you’re feeling particularly adventurous, you can also define a whole new ControlTemplate for Pivot or Panorama. 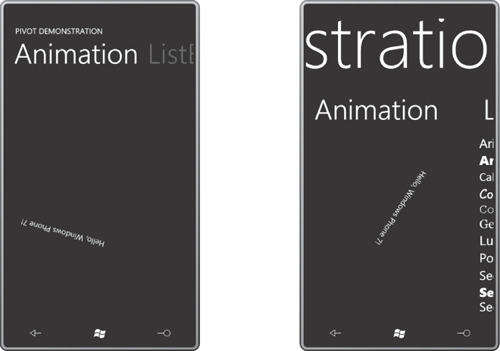 The Pivot template requires a PivotHeadersControl (which is a TemplateItemsControl of type PivotHeaderItem) and the Panorama template requires three PanningLayer objects. 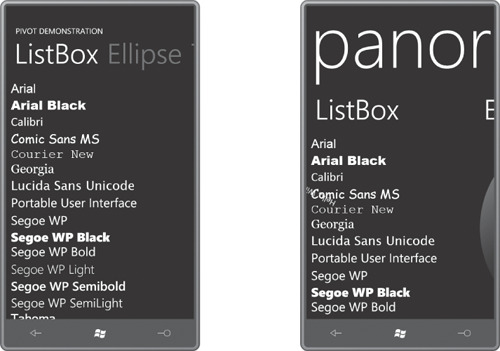 PanningLayer derives from ContentControl, and the Microsoft.Phone.Controls.Primitives namespace includes PanningBackgroundLayer and PanningTitleLayer classes that derive from PanningLayer. In the final view, we’ve circle back to the beginning. But in the Panorama control you can simultaneously see three PanoramaItem children: The ListBox is in full view, there’s a little sliver of the Ellipse at the right, but look at that snippet of rotated text intersecting the “Comic Sans MS” item: That’s the animation to the left.